South Australian seas contain some of the world’s most geographically concentrated natural temperature and salinity gradients. By examining changes across these gradients, researchers from the Marine Ecosystems Research Group are predicting how potential environmental changes could alter the distribution and abundance of marine invertebrates, a key component of marine ecosystems. The Group aims to project the geographical distribution of marine invertebrate species under realistic future climate predictions, by constructing spatial models using data from settlement plates and clearance experiments, and climate model forecasts. The work of the Marine Ecosystems Research Group is closely aligned to government policy. The Spencer Gulf and Gulf St Vincent of South Australia are dominated by evaporation, creating north-south temperature gradients of up to 15°C and highly variable salinities. These gradients are ideal for conducting experiments examining potential impacts of climate change on marine ecosystems. Experimental sites are currently located along the east and west coastline of Gulf St Vincent where sufficient human infrastructure exists for invertebrate establishment (e.g. jetties, pylons, channel markers). Funding is currently being sought to extend the study to Spencer Gulf. The Gulfs' ecosystems are also an ideal test region for marine community climate change predictions that will be applicable to most of the world’s mid-temperate marine ecosystems. 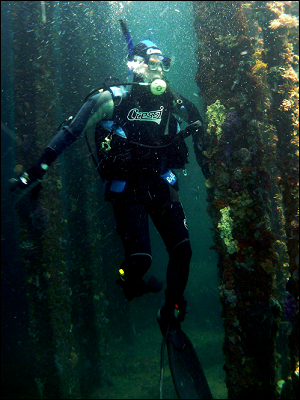 Marine invertebrate assemblages on jetty pylons have been surveyed at each site, and a clearance experiment established to monitor recruitment of new individuals and how the assemblage develops over time. These plots will be photographically monitored every three months for the duration of the study. In addition, we will be deploying settlement plates at the northern and southern-most sites to establish assemblages which can then be translocated to the other sites. 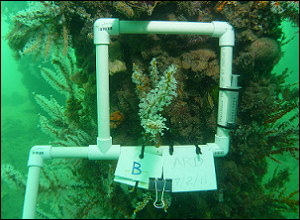 This will allow us to study how these assemblages change when exposed to different conditions. The Marine Ecosystems Research Group aims to project the geographical distribution of marine invertebrate taxa under realistic climate change scenarios, by constructing spatial models using data from settlement plates and clearance experiments, and climate model forecasts. Click here to see the location of the marine transects in South Australia.